From 1947 through 1949, legendary entertainer Al Jolson took the reins as host of the long-running Kraft Music Hall radio show. The show had the ideal format for the one-of-a-kind performer: let Jolson be Jolson and bring aboard the top star performers of the day as his guests. 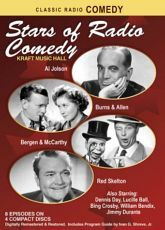 This collection finds Jolson welcoming some of the biggest names in radio comedy including Burns & Allen, Dennis Day, Edgar Bergen & Charlie McCarthy, Lucille Ball, Bing Crosby, William Bendix, Jimmy Durante and Red Skelton. Also appearing as Jolson�s sidekick is Oscar Levant, the pianist-raconteur, who had won over radio audiences with his unbridled sarcasm on Information Please. Here he never misses an opportunity to lob verbal hand grenades at Jolie�s age, multiple marriages, money and ego. Even today, Jolson�s Kraft Music Hall broadcasts are a testament to his immortal words: �Wait a minute, folks�you ain't heard nothin' yet!� This four CD audio collection features eight episodes, all digitally remastered and restored for your listening enjoyment. Also included is a Program Guide by radio historian Ivan G. Shreve, Jr. with photographs and background information about the shows.